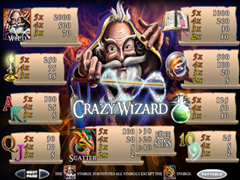 Crazy Wizard Pokie Review - Play today! This pokie offers winnings with such fantastical amounts that you will wonder if the wizard already pulled his wizardly tricks on you. This pokie will draw you into the magical world of winning spells and the magical dust will fill the reels until you realise all your dreams on 5 reels with 10 paylines and some magical features including scatters, wilds, multipliers and free spins. Created by Boss Media, this one will charm you off your feet with a huge jackpot bonus of 50,000 coins and the second highest payout of 25,000 coins. You cannot afford to pass this wonderful opportunity to win big playing Crazy Wizard as the betting starts from as low as 0.01 to 1.00 and the opportunity to bet up to 250 coins is available for those high rollers. The reels are set against a magical display of light and fire energy and the dark magical reels gives great exposure to each of the well-designed symbols, which includes green potions in laboratory formed glass vases, candle burning in golden candle holder, opened magical book of wizardry, crystal ball displaying magic and the poker symbols. The payline numbers shines bright on both sides of the screen. The wizard himself is a symbol you will find to be quite valuable. The wizard is wild, which means he can turn into any symbol when there is a combination when a symbol is required, the wild wizard will then be able to fill in for the symbol and reward you with the prizes. This is also your jackpot symbol, which will allow you to win 50,000 coins by getting all 5 of his symbol in a line. The colourful dragon is a symbol of its own that will reward you with great prizes and the activations of an amazing free spins bonus game. The rewards from the dragon are also another great feature as you will be able to receive up to 35,000 coins. The symbol is a scatter and this allows it to give you the rewards offered when it shows up scattered on the reels, you wont need to get this symbol in a line to win. To trigger the free spin bonus you need to get at least 3 of the scattered dragons on the reels. The game will reward you 10 free games when 3 dragons appear, 20 free games when 4 dragons show and 30 free games when all 5 appear anywhere. You will also have the ability to trigger the feature with free spins and add more free games to your total. 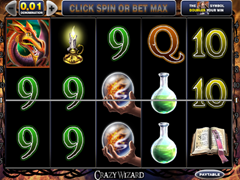 This pokie is magical with or without the magical lucky spell from the wizard. The fast spinning reels bring fantastic detail and wonderful symbols with great detail. The highest valued symbols even seen and fabulous winning opportunities from the bonus features. This is a must play pokie and offers great entertainment for hours.